Mykel Beckley – first appearance in over seven months after injury was the lone highlight for Khalsa. Sporting Khalsa endured their worst performance in many a long year, crashing out of the Staffordshire Senior Cup to a side they had just weeks earlier beaten 7-3 in the FA Vase. 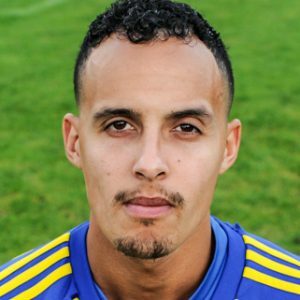 A fine Jack Tomlinson hat-trick for the home side did the damage as Khalsa were second in every conceivable department, the only consolation for the visitors being the second half appearance of Mykel Beckley for the first time this season after injury. Tomlinson put the home side ahead on 17 minutes, flicking the ball into the net past Sam Arnold to finish a right wing break. Four minutes later the lead was doubled thanks to Michael Williams, Tomlinson this time the provider. Lee Chilton‘s shot blocked by the legs of Adam Alcock when clear through on 25 minutes was to prove perhaps decisive, denying a lifeline that may have changed matters completely. As it was, Tomlinson made it three on 33 minutes. A triple substitution at half time stepped Khalsa up a notch but it was from a pretty low bar and not before Tomlinson wrapped up his treble with a header at the far post in off the woodwork on 53 minutes. Four minutes later Tomlinson narrowly failed to grab his fourth, dancing through the Khalsa defence and firing narrowly over from range. Dan Westwood pulled one back for Khalsa just before the hour, slotting home after a Mensah Kinch flick had wrong footed the Stone defence. Arnold pulled off a great save on 72 minutes to deny Jake Vernon from range and the evening was pretty much summed up on 75 minutes when Westwood headed straight at Alcock from a great Carlo Franco cross when it looked easier to score. Sporting Khalsa: Sam Arnold (captain), Vidal Hendrickson (Mykel Beckley), Adam Osbourne (Carlo Franco) Shawn Boothe, Leon Miles, Luke Adams, Alex Woodhouse, Alex Perry, Rico Taylor (Mensah Kinch), Dave Meese, Dan Westwood, Lee Chilton. Subs not used: Jay Holdcroft, Liam Armstrong.